Your iPad can help keep you healthy and fit — at least, if you use these apps. From keeping track of what you put into your body to guiding you through a workout routine, these apps can help you stay healthy and fit and create the body you want. 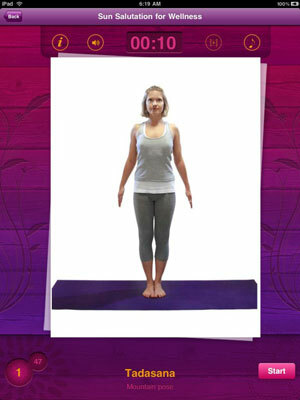 All-in YOGA HD has a database of 200 poses with images and instructions on how to perform the poses, two built-in programs that can custom-build a routine to match your abilities, goals, and time commitment, the option to build your own routines, a journaling feature that tracks your workouts, and a very good in-app Help system. The main poses have a 3D muscle view that shows you which muscles are stretched when doing each pose, which can help you understand exactly which muscles are going to be killing you the day after you try a new pose! Track your calorie intake and your caloric burn from exercises by using the LIVESTRONG.com database of more than 625,000 food and restaurant items, which also includes nutritional information. You don’t need an account to use the app, but you can customize a program and regime if you have an account. With GoMeals HD, you track your calorie consumption, carbohydrate intake, and how much fat you’re eating. The app has a fairly large database of foods, including grocery brands and restaurant brand foods. The app charts your intake in 7-day, 14-day, and 30-day graphs, and breaks it down by carbs, protein, and fat so that you can see at a glance how you’re eating. This app is based on The Navy SEAL Physical Fitness Guide developed by the U.S. Navy for its elite special forces. Accordingly, it has a lot of information about fitness, exercises, how and why those exercises work, conditioning, and how to work out to achieve the high level of fitness expected of the Navy SEALs. If fitness is your goal, you’ll likely appreciate all the research that went into the information in this app. This app is aimed at people who meditate, whether or not they’re specifically practicing Zen meditation. You can use it to time your meditation sessions, mark the starting and ending points with a bell. You can specify several settings, and then save these as presets. It has a built-in journal and keeps a log and statistics, too.